This entry was posted on Friday, November 5th, 2010 at 9:44 am and is filed under National Security Agency. You can follow any responses to this entry through the RSS 2.0 feed. You can leave a response, or trackback from your own site. hi ! your website very good. It is good our founding fathers knew how to use spycraft to bring our republic to life. Secret codes sound cool !!! Interesting Article, i am waiting for your next review…. I love gov blogs as well. Very interesting! Thanks. its for sure not many people know about this part of the printing office. i enjoy working with the congressional library,and the congressional record. thanks for this section. are/is there another such blog in the printing office.? It’s good to see a site where I can dig both old and latest articles. Just like the simplicity with which even the most difficult topics are written. Thanks for the info, great stuff! Gabby… thanks for the compliment! We at GPO appreciate it… Cheers! Great information. Thanks for the post. Yeah, I too wonder how the founding father would react with the government issues of today. Thanks for this article. I find the lesser known (somewhat secret) history of this nation very interesting. I’m going to have to take a look at the Masked Dispatches book too. Wow i never thought about espionage until i read this post.Hope you can write more posts like this. Hey there! Someone in my Myspace group shared this site with us so I came to look it over. I’m definitely enjoying the information. I’m book-marking and will be tweeting this to my followers! Fantastic blog and great design and style. hello Government Book Talk , i comment your blog , be a nice blog and perfect. Best for everyone. useful and National Security Agency content. i going to visit to read and review your website. helo Government Book Talk , i comment your blog , be a nice blog and perfect. Great for me. bulk and National Security Agency content. i going to often to read and comment your website. Reading your article reminds me of the movie buried treasure with nicholas cage where they uses all the cyphers and codes to find the treasure of our founding fathers. Great stuff! Yes, I don’t know how that extra “o” got in there. Thanks! I am a big colonial times and war of indepence(revolutionary war buff, I was just curious if secret codes of the founding fathers is a available from the GPO to buy by people like me. Go to http://www.nsa.gov/about/_files/cryptologic_heritage/publications/prewii/masked_dispatches.pdf and you can order a free copy. Enjoy! ACTUALLY THIS IS AN WONDERFUL ARTICLE!ACCORDING THE BOOK “MASKED DISPATCHES:CRYPTOGRAMS AND CRYPTOLOGY” CODES LIKE THEM , WERE THE BASE IN ESPIONAGE FOR MANY YEARS IN THE PAST.INTISPUTABLY , THESE CODES WERE A VERY EFFECTIVE DEVICE , WITH GOOD RESULTS!I WISH YOU HAD MORE INFORMATION ON THIS INTRIGUING TITLE! After reviewing the post on Secret Codes, I was struck by the depth of genius of the men who created the concept of America. How forward thinking they were. What quality they embodied. I am proud to be a citizen. 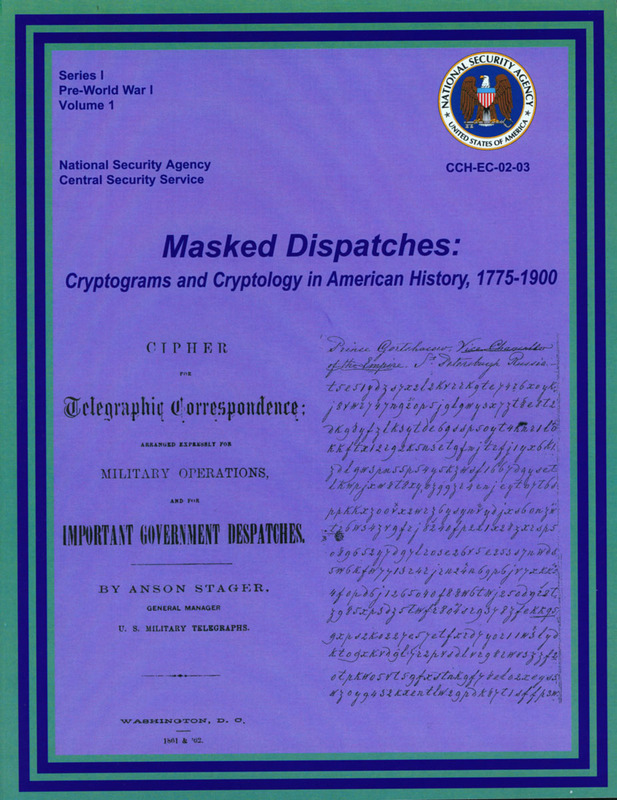 Direct link to the publication from the NSA website http://www.nsa.gov/about/_files/cryptologic_heritage/publications/prewii/masked_dispatches.pdf ; no further searching required. It is good our founding fathers knew how too use spycraft too bring our republic too life. A tribute to our Founding Fathers who would not approve of all the bureacracy that exists in our government today; especially when it comes to Food Stamps and the stipulations to get them. What happened to the original Food coupons that were administered by the Dept.of Agriculture? I wish you had included more bibliographic information on this intriguing title. United States Cryptologic History, Series 1, Pre-World War I, Volume 1. Published by the Center for Cryptologic History, National Security Agency. First edition: 1993; Second Edition: 2002.
helo Government Book Talk , i look your blog , be a nice blog and greatly. Great for me. best review for and National Security Agency content. i going to plan to read and comment your blog.